The phrase ‘broken record’ has never been so appropriate. 1. 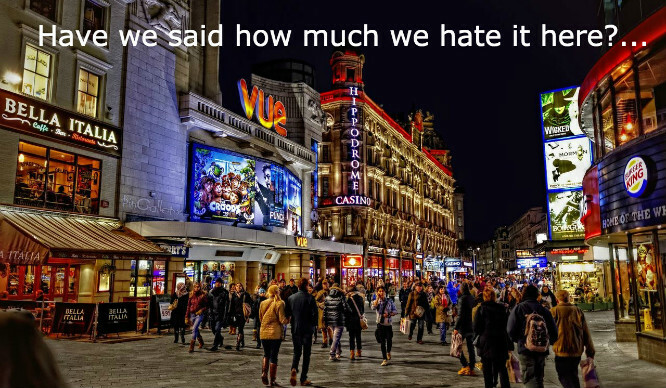 How much they hate Leicester Square. 2. How unbelievably pointless the Emirates Airline is. 3. How they’re using Tinder just for a laugh. 4. How hot it is. 5. How cold it is. 6. How rainy it is. 7. Whether the North or South of the river is better. 8. How expensive it is. 10. The pure, unadulterated joy of sitting at the front of the DLR. 11. Who has the worst landlord. 13. The fact that up North you can get a pint for less than £4. 14. Why the Circle Line is called the Circle Line when it’s not a circle. 15. How much they hate Made in Chelsea. (But still secretly watch it). 16. The coffee shop just down the road that does the best ever coffee. Like, really, really amazing coffee. 17. How they have a really busy day tomorrow. 18. And therefore really shouldn’t be having shots. 19. In fact, they only came out for one drink. 20. How tired they are. 21. The fact that literally no one ever in our generation will own a house. 22. How great it is to get out of London for a break. 23. But also how seriously great it is to be back. Hands Up If You Want Bad Brownie To Set Up London’s First Brownie Bar!